Oh my gosh! These vegan chocolate chip cookies are AMAZING! My son rated them a whopping 11 out of 10! They have no eggs or dairy and are without a doubt one of the best cookies I have ever tasted. My taste buds were definitely doing a happy dance as I was eating these. If you’re looking for a quick and easy choc chip cookie recipe, then this is it. YUM! First of all add your dry ingredients excluding salt & chocolate to your mixing bowl, then mix together. Now is a good time to get your oven on and set to 175 degrees C or 350 degrees F.
For the next stage add your dates, vanilla extract, celtic sea salt and rice milk to a blender and blend till smooth. Now add the blended mixture and chocolate to the dry ingredient and mix thoroughly. Use an ice-cream scoop or suitable spoon to place evenly place dollops of cooking dough on your lined baking tray. Pop your cookies in the oven for approximately 12 minutes or until golden brown. Leave the cookies to cool for 5-10 minutes before serving to the hungry hordes! Just made them and tagged you on Instagram Kids (7 & 9) loved them. Nice to find a butter free cookie recipe. My mix was wetter as we used spelt flour. Now the kids want scones (what Aussies know as scones)…help Anja’s! Ahh, I had a similar issue! I ended up adding some extra flour, but still were cakey. Yummy tho! Next time I’ll remember to change to US weights / measures. Does the Chocolate have oil in it? It does have cocoa butter. 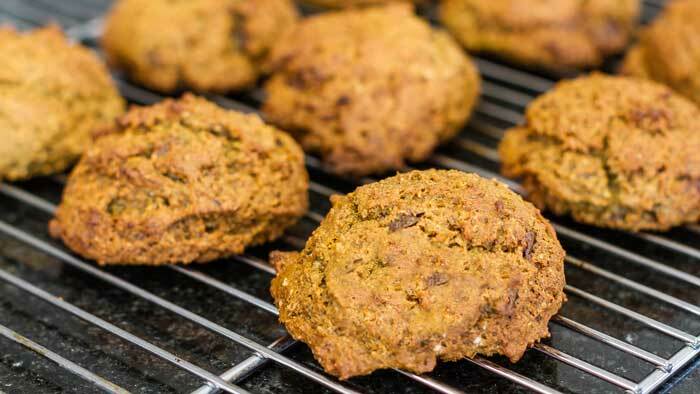 Best oil-free, nut-free cookie ever…. when the cookie is that low in fat, you feel a lot less guilty indulging in some chocolate chips. Thank you for sharing your fantastic recipe. I’m in Australia and I like Sweet Williams, Lindt dark chocolate and Vego. Oh my goodness! I made these last night. I am not vegan but my husband is. These are honestly the best cookies I have ever tasted. I have tried to perfect a vegan oatmeal raisin cookie, but it in no way can match these. Seriously fab! Thank you for such great recipes!